What Is The Best Horse Thermometer On The Market? Keeping an eye on the health of your horse is part and parcel of being a horse owner. You know if they’re lame because it’s obvious, but what about a more hidden ailment? 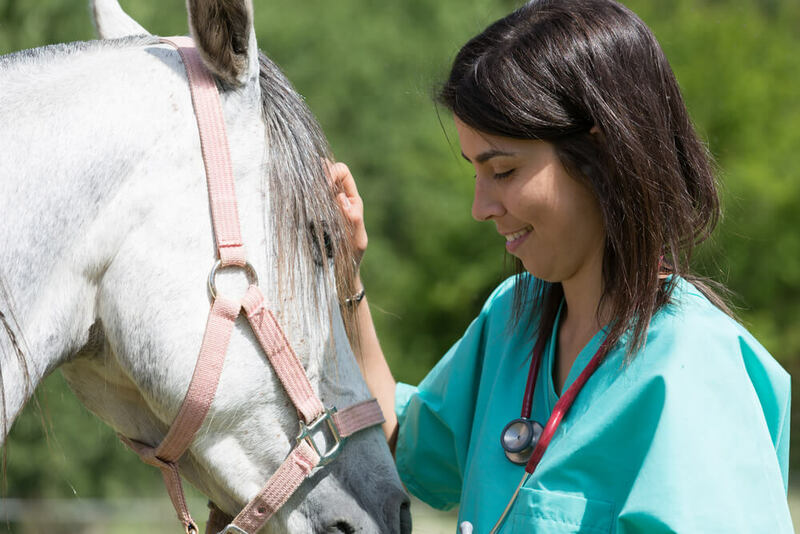 Having a temperature is a sure sign that the system is fighting off some kind of virus or bug, so knowing that your horse has a temperature is the first step towards making sure they are as healthy as they can be, and deciding whether or not you need veterinary intervention. This is a very clever no-touch system that allows you to take an animal’s temperature without even touching them. It is fast, accurate, and will help you take a temperature so you can determine whether your horse is overly hot. Easily switches between C and F – Depending on what you are used to, one method of temperature readings may be incomprehensible! With this handy gadget you can switch between Celcius and Farenheit, so you get a result you can understand. Alarm sounds if a certain temperature is exceeded – You don’t need to worry about not knowing what an ideal temperature is – a useful alarm will tell you if your horse is too hot and you need to take action. Has memory function – This means that you don’t have to remember what the previous temperature was, as it will pop up on the display. This makes it ideal for long term temperature monitoring. No need to insert anything anywhere – For the horse who is sensitive about his, shall we say, personal space, it is good to have a thermometer that doesn’t need to introduced into the body. A relatively expensive item – For such a small piece of kit, this one carries quite a large price tag! But it could be a small price to pay for peace of mind. A good device for measuring a horse’s temperature easily and without fuss, especially for those horses who don’t like to be fiddled with. Let’s face it, who enjoys being fiddled with when they’re poorly? With this thermometer you can check temperature in a completely non-invasive way. A rugged, strong thermometer – This one is designed for use on a farm, meaning that it is strong enough to withstand knocks and bumps and the occasional dropping. Fast, accurate measuring – Having a thermometer that does the job quickly, especially when it is measuring the temperature from a place your horse might not enjoy, is paramount. This one delivers an accurate reading within 8-10 seconds, with an audible beep to tell you when it has got there. Replaceable battery – You won’t need to worry about buying a new one just because the battery has run out, you can simply replace it. Comes with a handy guide – Printed on the back of this thermometer is a useful guide to the normal temperatures of common pets and livestock, very useful if you are not sure what you are looking for. May arrive faulty – One user reported that the thermometer arrived displaying “L” which normally indicates that the temperature is too low to record, and may indicate a broken thermometer. Simply return it for exchange. This is a great thermometer for use on horses that don’t mind oral or rectal use. It is hardwearing and accurate, which is just about all you need from a thermometer that is measuring the temperature of a large animal. A thermometer which gives extremely fast and accurate readings, this one is great for quickly and easily checking your horse’s temperature. It is solely for rectal use, and is shaped to be as comfortable as possible during the process. Takes just 6 seconds to record a temperature – Speed is of the essence with this type of thermometer, as some horses find it invasive. Luckily you can get an accurate reading faster than just about any other thermometer out there with the Pavia. Versatile shape for different sized animals – You can measure the temperature of your Shetland just as easily as your Shire with this ergonomically shaped thermometer, as the small diameter ensures the least discomfort. Easy to view screen – The large LCD screen makes it very easy to read the temperature, even if your horse is dancing about. 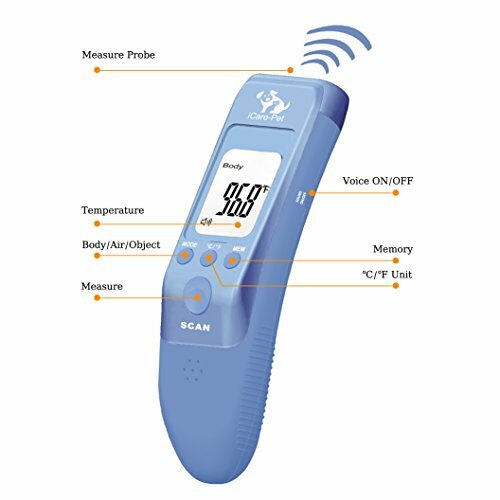 Ready to use from the box – You don’t have to scroll through different screens to find what you are looking for; this thermometer is set to go as soon as you turn it on. Not waterproof – It is easily cleaned with an antiseptic wipe, but don’t submerge the unit in water or may stop working. A great rectal thermometer for use in just about any sized animal. The fact that it gives such a fast reading makes this one very popular – also the batteries are replaceable, making this an investment that you can use for years to come. A thermometer for taking temperatures should be a part of your first aid kit, no question. If you worry that your horse is looking a little under the weather but you have no real way of telling, discovering whether or not he has a temperature will help you decide the best course of action. If your horse flatly refuses to have a thermometer in any orifice, then the Pet Thermometer For Cat, Dog and Big Ear Animal is for you. If you are looking for a well made, durable thermometer for rectal or oral use, try the SHARPTEMP-V Veterinary Livestock And Pet Thermometer. 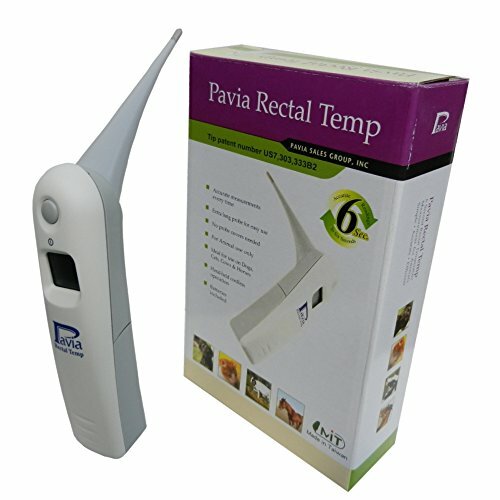 If you need a good, accurate thermometer that takes temperatures super quickly, the Pavia Fast Rectal Thermometer For Dogs, Cats, Horses Pets And Livestock is the one for you. These are good choices to review! All of them have the necessary features and give you an option if your horse does not want a thermometer in its ear canal.